Results: The pipes that rise from oil fields, topped with burning flames of natural gas, waste fossil fuels and dump carbon dioxide into the air. In new work, researchers have identified the structure of a catalytic material that can turn methane into a safe and easy-to-transport liquid. The insight lays the foundation for converting excess methane into various useful fuels and chemicals. 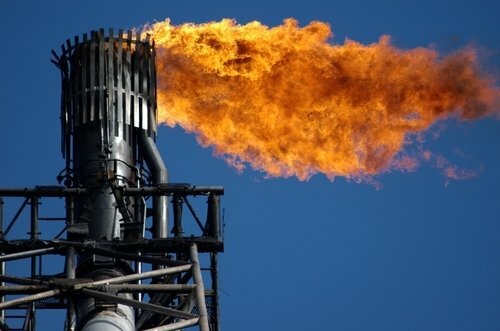 Why it matters: "There's a big interest in doing something with this 'stranded' methane other than flaring it off," said chemist Chuck Peden of Pacific Northwest National Laboratory's Institute for Integrated Catalysis. "An important thing researchers have struggled with is determining the structure of the active catalyst." That catalyst—molybdenum oxide sitting on a zeolite mineral—converts methane gas into the more tractable liquid benzene. But, the process is not yet commercially viable. Scientists don't understand enough about the molecular details to improve the catalyst. Now, researchers at PNNL and the Chinese Academy of Sciences' Dalian Institute of Chemical Physics in Liaoning province have worked out some of the details that will help researchers zoom in on an efficient catalyst. Working with China: They reported their results March 26 in the Journal of the American Chemical Society. This work is the first publication to come out of the International Consortium for Clean Energy, a collaboration between PNNL, the Dalian Institute of Chemical Physics, and China's Institute of Coal Chemistry. Methods: To get these results, the chemists—led by Peden at PNNL and Xinhe Bao at DICP—used the world's largest instrument of its kind—a 900-megahertz nuclear magnetic resonance spectrometer. The NMR is armed with one of the strongest magnets constructed and can be outfitted to investigate solid samples, a step above its smaller cousins. The combination of molybdenum oxide and a zeolite mineral had been shown in 1993 to convert methane, but the catalyst has been difficult to analyze. Researchers know that the zeolite anchors molybdenum oxide in place so methane and molybdenum oxide can react chemically, either on or in the zeolite channels. But, no one could tell which comprised the reactive form: a small nugget of one or two molecules, or a larger cluster of many molybdenum oxide molecules. "This uncertainty has led to a controversy in the scientific literature about the active phase and reaction mechanism of methane activation on these promising catalyst materials," said DICP's Bao. Enter the world's largest NMR, uniquely capable of addressing this issue. The technological problem lay in the molybdenum oxide itself. To study this particular oxide with NMR, the chemists needed to pick up the signal from one variant of molybdenum, 95Mo. The ultra-high field of the NMR, housed at the DOE's Environmental Molecular Sciences Laboratory, a national scientific user facility on the PNNL campus, allowed them to do so. "The higher magnetic field improves the signal to noise," said Peden. "And its large sample volume allowed us to put enough catalyst into the spectrometer to overcome the poor sensitivity of 95Mo NMR." The researchers painstakingly prepared catalysts with increasing concentrations of molybdenum in the zeolite scaffold and focused the 900-MHz NMR on the samples. The data revealed two different forms of the catalyst, as expected. One form contained the smaller nugget and the other form comprised the much larger clusters. When the concentration of molybdenum rose, more of these large clusters formed. Then, the team added methane and measured how much got converted into benzene by the catalysts. They found that when more smaller nuggets were present, more benzene was made, indicating the variety of one or two molybdenum oxide molecules was the reactive one. What's next: Now, said Peden, the challenge is to design and produce the active form of the catalyst that could be used for large-scale benzene production, research that Bao and his group are already working on. "We need to figure out how to get that structure and keep it that way," Bao said. Acknowledgments: The research was sponsored by the Natural Science Foundation of China and the DOE Office of Basic Energy Sciences, Division of Chemical Sciences. This work was conduced by Heng Zheng, Ding Ma, and Xinhe Bao of the State Key Laboratory of Catalysis, Dalian Institute of Chemical Physics, Chinese Academy of Sciences, and Jian Zhi Hu, Ja Hun Kwak, Yong Wang, and Charles H. F. Peden of PNNL. Work was performed at DOE's Environmental Molecular Sciences Laboratory, a national scientific user facility at PNNL. This work is part of PNNL's work to develop tools and understanding required to control chemical and physical processes in complex multiphase environments. Citation: Zheng H, D Ma, X Bao, JZ Hu, JH Kwak, Y Wang, and CHF Peden. 2008. "Direct Observation of the Active Center for Methane Dehydroaromatization Using an Ultra-High Field 95Mo NMR Spectroscopy," Journal of the American Chemical Society 130(12):3722 -3723. DOI: 10.1021/ja7110916.